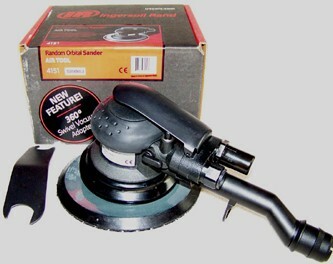 Ingersoll Rand 4151 Orbital Multi-purpose Air Sander has 3/16 in/5mm orbit and 360 degree swivel vacuum adapter.. The ultimate in low vibration, high performance finishing. Super duty, ergonomic comfort grip, lubrication-free motor package, directional exhaust muffler, vacuum-ready dust evacuation, adjustable speed up to 12,000 RPM. Lightweight composite housing.